Jennifer Henry added special doors to her Three Springs home so her dog, Grace, and three cats can come and go as they please. According to a new study by the National Association of Realtors, 52 percent of survey respondents have done a home renovation project to accommodate their pets, such as installing fences, dog doors and laminate flooring. “A bird may love a fish, but where would they make their home together?” playwright Joseph Stein famously wrote. It’s a poetic musing too familiar in Durango, where owning a pet seems almost a requisite, yet finding housing options that are welcoming to animals is a struggle. A new report from the National Association of Realtors indicates that pets have an influential role on their owners when it comes to buying, selling, renting or renovating a home. 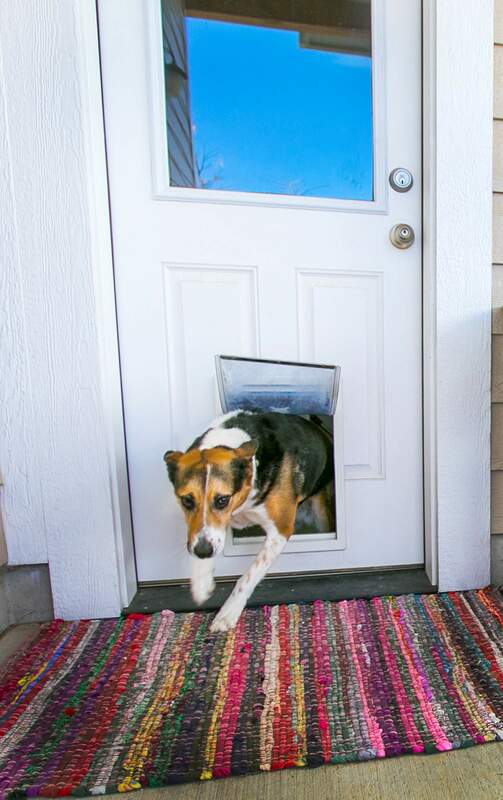 According to its first-ever Animal House: Remodeling Impact report released this month, 81 percent of the more than 3,000 respondents in the U.S. said pets are a consideration in decision-making when it comes to finding a home. Sixty-one percent of surveyed pet owners said it was difficult to find a rental property or home owner association that allows or accommodates animals. As evidenced by real estate agents’ accounts, pet owners’ personal narratives and even social media pleas for help finding pet-friendly living quarters, the same is true for Durango animal lovers. For Three Springs home owner Jennifer Henry, not just any house would do for her dog, Gracie, and three cats: Chiwii, Lily and Hope. Henry’s house has doors leading from outdoors into her garage, and from her garage into her house. “They can come and go when I’m gone,” she said. Henry bought her house in 2015 because of its proximity to a Horse Gulch trailhead to take Gracie on walks, fenced-in yard and front porch, and low traffic volume that would be welcome for her indoor/outdoor cats. Incidentally, the windowsills were also built wide enough to let the cats sit comfortably to spy on outdoor activity. According to the Animal House study, 31 percent of real estate agents polled said often or very often their clients refuse to put in an offer on a house because it isn’t ideal for their pets, and 67 percent agreed an animal has a moderate to major effect on selling a home. Todd Sieger, a local real estate agent, said he’s known buyers to refuse homes that were great fits because there were restrictions on pets. Real estate agent Jeremy Christensen also said his clients put their pets’ needs high on their checklist, with some factors even being deal-breakers, including fenced yards, separate mudrooms or entryways and proximity to grooming services. For whatever reason, Christensen said, the people drawn to the Durango area for the active, outdoor lifestyle often seem to have pets, especially dogs. And for those people, trail and public land access is a great asset. The National Association of Realtors conducted its first-ever survey of U.S. real estate agents and pet owners on how pets play a role in home buying and renting decisions. 81 percent said pets influence their decision-making when it comes to their living situation.12 percent said they have moved to accommodate their pets.61 percent said it was “difficult” or “very difficult” to find a rental property or home owner association that accommodates animals.31 percent of agents surveyed said clients “often” or “very often” refuse to put in an offer on a home because it isn’t ideal for their pets.67 percent of agents said owning a pet has a “moderate” or “major” effect on selling a home.89 percent of pet-owners would not give up their animal because of housing restrictions.52 percent have invested in home renovations to accommodate pets, including fenced-in yards, dog doors and laminate flooring.